South London has no finer lost river then the Effra. From Norwood down to Vauxhall. 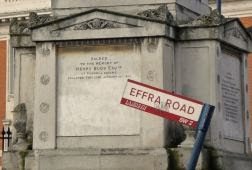 At the top of Brixton Road (at Hazard's Bridge) the Effra veered left, forming the south-western boundary of Kennington Common. Throughout the 18th century this open space was a gathering place for public speaking, and also an infamous place of execution for the county of Surrey. St Mark's church, built in imposing classical style beside the Effra in 1824, now occupies the corner of the common where the gallows were erected [photo]. The creek continued west beneath Clapham Road (at Merton Bridge), approximately where Oval tube station stands today. This old Roman Road formed the dividing line between the medieval manors of Kennington and Vauxhall. Two street names in south Brixton appear to provide a very obvious reminder of the river's former passage [photo]. Effra Road is one and Effra Parade the other, the pair linked by the very rivery-sounding Brixton Water Lane. But neither runs along the former route of their eponymous river, which instead meandered through former farmland between the two. In medieval times this area was part of the Manor of Heathrow (nothing airport-related, merely 70 acres of agricultural freehold). Over subsequent centuries it's possible that typically lazy London pronunciation – casual dipthongs and dropped aitches – caused the manor's name to evolve from Heathrow via Hethra to Effra. A likely story. By the early 19th century the river valley south of Coldharbour Lane belonged not to Heathrow Manor but to Effra Farm. And it was this lowly half-mile swathe of rural meadow and market garden which, it's believed, lent its name to the entire river. Effra Road started out in 1810 as a quiet track along Effra Farm's western boundary (the former farmhouse is marked today by the Effra Road Trading Estate). Improved road access soon encouraged property development which devoured the entire farm site, with Effra Parade part of the second wave of building in the 1830s. For a glimpse of how things used to be, crouch down on the pavement outside the Happy Shopper on Effra Parade [photo]. Beneath the minimart window is a tiled panel, origin unknown, depicting a sylvan scene of the Effra from yesteryear. A river curves through open fields past some pristine farmhouses and an unlikely blue cow. It could be any imaginary river anywhere, to be honest, although let's give the artist the benefit of the doubt and believe it's Brixton's Effra. Proceeding northwards comes the Effra Hall Tavern - unrelated to the old river except in location [photo]. The stream then wiggled north beneath Coldharbour Lane, once a rural thoroughfare, now at the heart of bustling Brixton. This historical legacy was exploited one summer Saturday in 1998 by a bunch of anti-car protesters calling themselves the "Effra Liberation Front". They blocked off the western end of Coldharbour Lane (and a chunk of neighbouring Brixton Road) to make their point, and five thousand people attended the street party that ensued. As for liberation, however, a few hastily-filled paddling pools were the only evidence of surface water. Romantic though it might seem to "reclaim" the Effra, Brixton's residents probably wouldn't appreciate the upheaval. 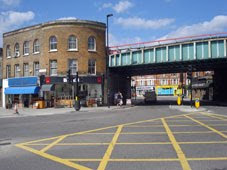 Rehabilitation would require roadworks to reinstall a bridge across Coldharbour Lane [photo], the flooding of one of Brixton's famous covered market arcades [photo], a ford bisecting the eastern half of Electric Avenue [photos] and a new channel dug through the motley collection of shops beneath the station. More radical souls might however delight in the demolition of Brixton Police Station, itself first housed in a hut on a bridge above the Effra. The Effra exited West Norwood through its cemetery. 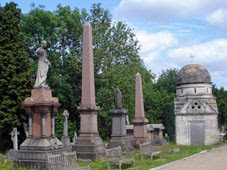 This is one of London's Magnificent Seven cemeteries, is West Norwood, containing some of the finest funereal monuments in the capital. Obelisks, mausoleums, catacombs, that sort of thing, all jammed together in a beautiful higgledy-piggledy configuration [photo]. Sugar magnate Henry Tate, cookery goddess Mrs Beeton, even the Charlie who launched the FA Cup, they're all buried here. As too is the Effra, now landscaped out of all existence. After crossing several residential streets to the north, the Effra met up with an incoming tributary close to West Dulwich station. Nearby is Belair Park, which may be the only place where the river Effra can still be seen on the surface. The park's tree-lined lake certainly looks convincingly river-ish. It's long and sinuous. It has reedy banks where waterfowl bask and feed [photo]. And it lies roughly along the same north-south alignment as the original stream. It could easily be a last remaining chunk of river, or a tributary amputated for decorative effect. All that's certain is that a lake existed here in 1785 when the surrounding estate was leased from Dulwich College by John Willes, a Whitechapel corn merchant. His grand house, later named Belair, grew over the years to become a 47-room mansion. Today it's rather smaller, restored by the council and used as a restaurant [photo], but the lake still forms the ornamental centrepiece of its grounds. Even in its first half mile, the valley carved by the fledgling Effra is clearly evident. It flows along a pronounced depression beyond Chevening Road, now infilled with housing and a school, but once the site of nothing more than a four-plank bridge. Traffic negotiating Hermitage Road from ridgetop to ridgetop must descend steeply, then climb again, to cross the broad valley of a vanished stream [photo]. But trace the river along Hancock Road, to a grassy verge at the end of a short cul-de-sac, and it's still possible to hear 21st century Effra waters rushing beneath an anonymous manhole cover [photo]. Allegedly, that is - I'd recommend not wasting your time listening to find out. Legend tells that Queen Elizabeth I's royal barge once sailed up the Effra as far as Hermitage Road. A quick glance at the gradient of the hill beneath this spot should be sufficient to confirm that this supposed regal voyage never took place. 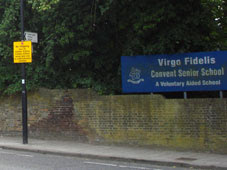 After exiting the grounds of Virgo Fidelis convent school, the Efrra emerged onto flatter ground through an obvious dip between Crown Dale and Central Hill [photo]. 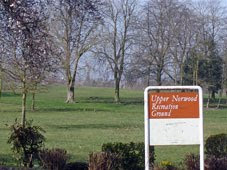 It then curved across Elder Road into what is now municipal Norwood Park, close to the multi-purpose sports court. In the early 1800s this stretch of the Effra marked the western boundary of Great Elderhole Coppice - one of the last surviving remnants of the 1400 acre Great North Wood (after which the suburb of Norwood was named). This area has long been susceptible to flooding. A particularly heavy storm on 17 July 1890 caused the Effra to become a raging torrent, sweeping away part of the Virgo Fidelis convent wall. Repairs in the brickwork are still visible to the right of the school gates. Properties in Elder Road were also badly affected. A plaque marking the 1890 flood level is alleged to exist on the south wall of the Outdoor Relief Station at Elderwood Place [photo], although I've looked and looked (as much as any man can without trespassing) and I can't see a thing. I even asked the owner of a neighbouring cottage, and she told me she'd been living there for 30 years and had neither seen nor heard of it. The river valley remains more than obvious here, dipping across suburban sidestreets to the east of Elder Road. At Gipsy Road's lowest point, beside the rear entrance to Lambeth's pupil referral unit, stands a mysterious green post [photo]. At pavement level it looks like a fairly ordinary lamppost, apart from the fact that it's the wrong colour, ribbed and rather thicker than usual. Look up and you'll see there's no lamp atop the column, just a pipe open to the sky, and considerably taller than the commonplace telegraph pole alongside. 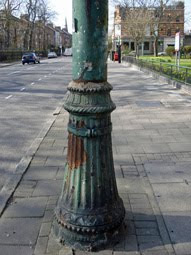 Because this green post is a Victorian stinkpipe, erected to provide essential ventilation for the sewer that now passes immediately beneath. One hopes that local residents don't need to keep their windows closed during hot weather as a result. The river hugged the railway (or, chronologically speaking, the other way round) on its approach to West Norwood station. 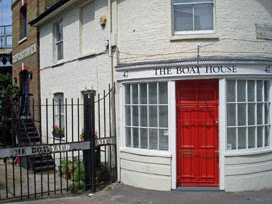 At the foot of Pilgrim Hill there's a business-like address called "The Boat House", which geographically could have been true, but I suspect is little more than a coincidence. Immediately before the station comes East Place [photo], currently little more than a row of arches where cars get mended and deals get struck. Here in June 1914 the floods struck again as the sewers bubbled up - trapping animals, inundating cellars and ruining many a Sunday roast. A more effective flood relief sewer was built later, and this protects even those asleep within West Norwood Cemetery from any unexpected deluge. If the Fleet is North London's iconic lost river, then South London belongs to the Effra. It's got a brilliant name for a start. Nobody's 100% sure where the name came from - possibly from "efre" the Anglo-Saxon word for 'bank', or from "yfrid" which is the Celtic word for 'torrent'. I'm not entirely convinced by the latter, given that this six mile stream could never genuinely be described as torrential. There are a few semi-steep slopes at the Norwood end, but any lower the gradient's so shallow you'd never guess there was ever a river here. Through Brixton down to Vauxhall, the Effra's long gone. Two centuries ago, if you'd have been standing in the rural wilds of what is now the London borough of Lambeth, a small brook would have trickled by. It ran through fields and meadows and peaceful countryside - a landscape almost impossible to imagine today. Norwood really was a wood, Brixton was only a few scattered cottages, and Kennington was just a big common where convicted criminals got hung. The Effra widened as it flowed towards the Thames, eventually broad enough for a small boat, but for most of its length think 'paddling-depth stream' and you'll not go far wrong. Then came the railways, and the onslaught of suburbia, with housing easily built on the raised terraces above the floodplain. The Effra dwindled to an unwanted sewer, covered over around the same time as the Albert Embankment was built, with its waters culverted and buried. 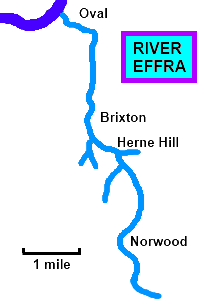 The original Effra wasn't simply one river, it was a series of tiny tributaries covering a broad catchment area. Most of these ran down from a long ridge of high ground running roughly from Sydenham to Crystal Palace. One of these tributaries, for example, was known as the Ambrook. It kicked off in Sydenham Hill Woods (across the valley from the Horniman Museum), where there are still ponds and occasionally-damp channels to be found in the undergrowth. A poorly-used railway once ran this way, along an artificially flat terrace leading to a bricked-up tunnel under Crescent Wood Road. The Ambrook, meanwhile, ran downhill across what is now Dulwich Golf Club, past Dulwich College towards the main Norwood trunk of the river. I'll not be writing much about the Effra's many tributaries. It would take too long, and others have done the job too well anyway. Here for example is a fine page about the geology and geomorphology of the Effra basin, which contains far more proper detail than I'm going to write over the next few days. And here's Edith's blog, currently following the various Effra tributaries and writing about what's there now and what was there then. The historical detail is fantastic, and again is far more useful than the skim-past I'm going to deliver here. 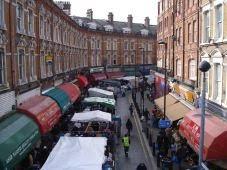 The Effra lives on as an urban legend, untraceable for most of its length by the uninitiated, apart from the odd major road in the Brixton area since named after it. There are occasional attempts to resurrect its memory, most notably in 1992 when a local arts group opened up an office under the banner of the "Effra Development Agency". Theirs was a tongue-in-cheek attempt to inspire a revival for the river valley, much as the unloved Docklands had recently been reborn. Posters and newspapers amplified the message, only for a short time, but long enough to lodge the river firmly back in south London consciousness. As for raising the river back above ground, I really wouldn't recommend it. 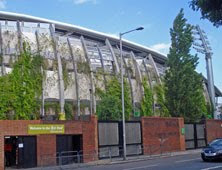 An awful lot of Victorian terraces would become uninhabitable, the centre of Brixton would switch from market to watergarden, and there's even a major cricket ground where the boundary might become a water hazard. Better that we remember where the Effra used to run, and recognise the enormous influence it's had on settlement and communications. Starting tomorrow, up Crystal Palace way. If you're especially interested (and south Londoners tend to be rightly passionate about their own patch), the Brixton Society published a 28 page booklet about The River Effra back in 1993. It has a full history from source to mouth, plus a proper map without which I'd have got proper stuck while producing what follows. The Society's website alleges that it's available for £1.50, if indeed it's still in print, although I found a copy lurking upstairs in the Local Studies section of Brixton Library. I don't always write about the London Underground, honest I don't. But sometimes when I don't, readers nudge me via email and ask "you have seen this, haven't you?" And usually I have, I just haven't told you that I have. Tube-y things are announced in all sorts of places online, and I have no intention of simply rebroadcasting a stream of news items and latest developments published elsewhere. On this occasion, however, I'm capitulating before anyone else sends me an email about item number 1 below. 1) Live train map for the London Underground: Ooh this is clever. TfL recently made available, in web-designer-friendly format, detailed information regarding where tube trains are and where they're going. So a friendly web designer called Matthew has knocked together the aforesaid information into a dynamic London tube map. It's a Google Map, so it's not beautiful underneath. It's rough and ready, so the trains move in straight lines between stations rather than along precisely correct tracks. It's not perfect, because sometimes TfL's data has big holes in it. And it's a bit rough and ready, because it was knocked up at a Science Hack Day over the weekend and was never meant for mass consumption. But enough of the caveats, it's great. Little yellow blobs move around town in approximate real time, with timing and destination information apparent if you click on them. You can spot gaps in the service, and bunching, and the fact that some lines are considerably busier than others. Watch for longer and the entire network shifts around, giving some idea of the complexity TfL face in keeping Londoners moving every day. Clever innit? And it's only the start. 2) API Beta: I mentioned above that TfL had recently made available lots of detailed tube-running information in web-designer-friendly format. Well, that information is here, on the london.gov.uk website, as part of a GLA initiative to release as much of the data that it holds as possible. As well as the "Train Predictions Service" there are also datafeeds for "Station status" and "Line status" which any budding codemonkey is free to turn into online applications galore. Here, for example, is the datafeed for District Line line trains due to pass through Earl's Court in the next half an hour. Change D to P and you get Piccadilly line trains instead. Change the line to N, and ECT to CTN, and you get Northern line information for Camden Town. Works for any line and almost any station, so long as you're using the correct codes (which are listed here). Even if you can't make the output look nice, you might relish the opportunities this raw data provides. 3) Aldwych station reopens: If you're a proper tubegeek, those are three words you'll have been longing to hear since 1994. The abandoned Piccadilly line station at Aldwych is high on the list of unattainable Underground destinations, although occasionally used by film crews and exceptionally fortunately mortals. Well, TfL are opening up Aldwych station for a fortnight, starting on Monday, and you'll all be able to take a look inside for free. Before you get too excited, you'll only be allowed into the ticket hall, not down to the disused platform. And it's only being opened to tempt you inside to view an exhibition on how the Tube is being transformed. But hey, this is Aldwych, and it's opening up next week. If your trousers are damp at the very thought, I suggest you change them now. 4) Tube strike: Oh my God there's a tube strike on. The world may end, there's a tube strike on. Bob Crow has said angry things. TfL have said conciliatory things. Panic, oh Londoners, because transport Armageddon is underway! Except, hang on, travelling passengers haven't thus far been excessively disrupted. This is merely union arm-flexing designed to make waves. It's media-filling bluster. I apologise for not mentioning it earlier. 5) Cheap rail tickets: OK, this isn't Underground-related, but it is a top tip for London rail travellers. If you're planning on taking an off-peak return trip out of the capital over the next month, there are some huge savings to be made. You have to travel off-peak, you have to start at a participating London terminus station, and you have to have an Oyster Card or Freedom Pass. But if that fits, simply pick a destination off the agreed list, pick a day to travel, and print out a voucher off the website. How do you fancy Chichester for a fiver, Warwick for £10, Liverpool for £15 or Cardiff for £20? Or all four, because there's plenty of time to fit in several return journeys before 25th July. Hell, you could even upgrade to First Class for not much more money. Here's the full list of possible destinations. Here's a map showing prices. And here's the voucher. Don't forget to tick the 'no publicity' box before you send your information. But, blimey, where to start? and 6) Off The Rails: London author Christopher Fowler has just published his eighth Bryant and May mystery. It's the latest in his series of quirky crime novels featuring two octogenarian detectives at the Peculiar Crimes Unit, and this time the main action takes place in the deep recesses of the Underground network. Maybe even Aldwych station, you never know, I haven't read my copy yet. The hardback's not cheap, so you could always wait a year for the paperback, but where Bryant and May are concerned I can never hang on that long. The previous seven books come highly recommended, as does the rest of Mr Fowler's mystery-packed oeuvre. And I'm particularly looking forward to discovering whether the latest novel does indeed feature an obstructed 'next train indicator' at some crucial moment in the plot, because if so the inspiration started right here. It's time once again for me to remind pluggers and marketing types not to send me emails. They're still doing it. And I'm still not interested. I'm not the sort of blogger who waxes lyrical about ad campaigns and product endorsement, and I never mention any event or service that's been drawn to my attention by the promoter. So here are some more desperate requests for publicity, but with all the brand names heartlessly deleted. And I hope it's damned frustrating for all those concerned. Tired of all the doom and gloom around? Is the idea of tightening your belt tugging the corners of your mouth down? Think you know a bit about <academic subject> and everything else? Why not try and forget all that for one night and come along to our comedy quiz night at the <famous London museum> on <date> June. It turns out that tickets to this credit-crunch-friendly quiz night cost over £10. Someone should judge the mood before they send this stuff out. I hope you're well and enjoying the lovely sunshine! I have a story that I thought you might like as a Londoner (and a writer about London!) <Large medical company> have developed a unique project to find the mood of the nation using social media. By analyising more than 66,000 tweets <large medical company> has been able to reveal the prevalent mood of London in the last four weeks was ‘in love’ (2,508/47% in the past four weeks alone). <Large medical company> were able to gather this information thanks to their ‘<special map>’ which breaks down tweets by location and mood by combining twitter data with Google maps resulting in a real time mood map of the UK. I don't know about you, but if I were a scientist I'd be ashamed to be associated with this twaddle. We thought your readers may be interested in the next talk at <popular museum> as it is dedicated to your local areas. We would love it if you could include it in your next blog and on your website. The talk is a part of <popular museum>'s public programme for a new exhibition. Please contact me if you require any further information or images or if you wish to come to the Museum as our guest to review the exhibition. I paid good money to go to the previous exhibition at this museum, and thought it was a bit poor. They should count themselves lucky I never got round to reviewing it on here. I’m <name> and I am helping to organise a blogger evening at the <name of pub> pub in Camden, which involves a collaboration between the <well known brand of stationery> and the <unheard-of> blog. The event, which ties in with the 30th birthday celebrations of the <well known brand of stationery>, takes place this coming Monday. I was wondering if you would like to attend? It’ll be free of course and there will be some giveaways and fun competitions on the night. One of the inventors of the <well known brand of stationery> will also make a guest appearance to answer any questions on the night. Would love to have you come down. To any of you out there who might still believe that social media and marketing are a match made in heaven, I'm afraid this is the reality. And finally, here's an email that judged the mood correctly. I have just found your blog and wanted to get in touch: I am contacting you from <Arts Centre>, an arts centre located in <East London location>. I really liked your blog and wondered if you'd agree for us to add your contacts to our press list so that you are kept up to date with our future events? Please let me know if you'd rather avoid press email from us! I look forward to hearing from you, and would be delighted to give you more info on <Arts Centre> if you ever happen to be around! Slightly too many exclamation marks, but Claire's got precisely the right approach. Assume nothing, ask politely, and see if the recipient bites. I didn't, but I suspect she'll have had more luck elsewhere. Watch and learn. Meanwhile if you're a blinkered social marketing guru who hasn't taken the hint yet, please go whore your goods elsewhere. Many thanks. I have a problem at work and I wonder whether you can offer me some advice. It's regarding the screening of England's World Cup match this afternoon. The thing is, I'm not really very interested. I mean, it'd be nice to think England might progress a bit further in the competition, what with us having invented the game in the first place. But if we get kicked out, well, it'd be no great loss to me. Last time England played I went shopping, and the time before that I went out for a walk. I don't feel a fervent passion welling up within every time Rooney pulls on an England jersey. I don't yell swear words at the TV every time one of our players hits the woodwork. My summer won't end the day we lose at penalties. Trouble is, the rest of my work colleagues don't see things that way. This afternoon at three o'clock, my England football apathy will be laid bare. Many offices are forcing their employees to work through the big deciding match, but not mine. They're setting up a big screen in the canteen so that anyone who wants to watch can do so, and inviting them to make up their hours some other time. There won't even be a bar to make the waiting bearable, just a lot of smart-casual blokes from accounts getting over-excited and cheering a lot. Me, I'd rather work straight through and go home on time while the trains are empty. Thank goodness attendance isn't mandatory. But I'm not working in the office today. I'm being sent far out of town to take part in some important work-related event, evidently scheduled by somebody who wasn't thinking carefully about the date. It's a full nine-to-five day, with a set number of tasks to get through, and we can't leave until they're finished. There are four of us taking part, only two of whom are fervent footie fans. More to the point, one of those two fervent footie fans is my boss. My boss wants to break off from the task in hand at three o'clock to watch the match, then come back afterwards to carry on working until seven! His priorities are very different to mine. What's more, my boss thinks I'm a big football supporter too. I'm quite good at knowing just enough about the team's matches and scores to make it sound like I know what I'm talking about, and I nod and smile and agree with him at all the right moments. But he's always referring to specific players and selection rumours and specialist stuff, about which I know very little, and I genuinely can't believe he hasn't noticed my lack of knowledgeable depth. Today, I fear I'll get caught out. I could confess. I could admit to not being as interested in the national game as England expects. I could pair up with the fourth attendee, whose footballing passion is non-existent, and see if we can get our half of the work done by the final whistle. Or I could capitulate. Go watch the match in good grace, and try to get into the spirit of the event. Let the other two power the conversation, and interject occasionally with something appropriately up/downbeat. Two hours of my life I'll never get back, but what the hell, this is a nationally important event. Any advice gratefully received. And hurry up, because I can't hide my indifference forever. DG replies: Sorry, this is not a situation I can identify with. At all. Obviously. But I'm sure you'll work out something, you miserable apathetic killjoy. Green men no longer flash. If you're a UK pedestrian, you must have noticed. The flashing green man was wiped out years ago, and pedestrian crossings stick to a much simpler pattern. After the red man comes green, then where green used to flash there's a blackout, no colour at all, before red reappears. Or at least that's how it is for the time being. Flashing green used to confuse people, apparently. They thought it meant "cross right over, and hurry up", whereas in fact it meant "don't start to cross, but if you're on your way keep going". It used to instil unnecessary panic, whereas in fact it was still perfectly safe for any pedestrian in the road to carry on crossing. So the powers that be switched off the green flasher, and that confused us even more. We never really understood what the blackout meant ("don't start to cross, but if you're on your way keep going"), assuming cars were about to accelerate into us at any second. We dithered, we rushed, we walked out into the traffic without thinking, and all because absence of symbol gave absence of message. But that's all changing. As of this week, London boasts the UK's first Countdown Crossing. A digital timer which kicks in when the green man disappears and hits zero when the red man returns. 12, 11, 10... still ages, you can make it ...9, 8, 7... if you run, you'll get across ...6, 5, 4... hurry, there'll be traffic soon ...3, 2, 1... you're pushing your luck ...0... run!!! The idea is that a countdown means so much more than a blank screen, and pedestrians can better judge what chance they have of crossing depending on time remaining and their fitness. A huge improvement, surely. Or maybe not. These countdown timers cost money, because they're bolted on rather than replacing an existing light. There are thousands of signal-controlled crossings in London, so to spread this innovation across the capital would cost millions. And then there's the sneaky bit. Along with the countdown timer comes a re-phasing of the associated traffic lights. Where previously the green man might have shown for ten seconds, now it only shows for the statutory minimum of six. There's still plenty of safe time to cross while the numbers tick down, a period whose duration remains unchanged, but the proportion of time spent on green is reduced. This is, essentially, a cunning wheeze to increase the amount of time during which traffic can pass through a set of lights. This alteration, which on the face of it only benefits pedestrians, is really a clever way to boost the dominance of the car. If you read TfL's press release from yesterday, you might think this countdown trial was already well underway at eight different locations. Not so. I went along to one of the trial spots, at High Holborn, and no adjustment to the traffic lights has yet been made. No bolt-on timers, no shorter crossing times, not yet, nothing. As I understand it the sole location so far is outside Southwark tube station, should you ever be in the area. While the year-and-a-bit long trial continues, pedestrians get greater information and car drivers get more time. It's either a petrolhead con-trick or a transportation triumph. Only time will tell. I do like the London Festival of Architecture. It celebrates buildings old and new (especially new). It picks bits of the capital and focuses on their heritage and future. It only runs every two years, making it a bit of a rare treat. And it's on right now. Did you notice? I've been a fan of the LFA ever since it started six years ago. It was called the London Architecture Biennale at the time, which proved rather impenetrable a name and has since been dumbed down. 2004's festival was focused around Clerkenwell, and was small but fascinating. 2006 expanded to cover King's Cross and Southwark, and then 2008 extended further to reach Kensington and Docklands. Mini-installations, temporary pavillions, architectural talks, and all sorts of out-of-the ordinary events. What's not to love? This year we're back to three geographical hubs, the first of which (this last weekend) was based up and down Regent Street. 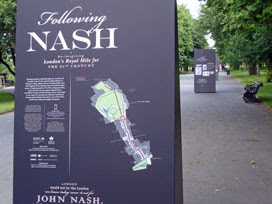 It's 200 years since John Nash planned this grand thoroughfare through the West End, cutting across the existing street pattern to create a right royal shortcut from his new Regent's Park to The Mall. The street would have been straight, except the rich houses of Cavendish Square were in the way so he added a bend at Langham Place (where BBC Broadcasting House now stands). It was Nash who created colonnades at Oxford Circus, previously a mundane crossroads. South of here Regent Street swallowed up an existing street called Swallow Street, which now exists only as a severed narrow rump down to St James. A sweeping Quadrant curved to meet Piccadilly at another new Circus, before continuing south to meet Pall Mall at Waterloo Place. Central London had seen nothing like Regent Street before, and has seen no large scale intervention like it since. If this sort of stuff is up your street, you'd have enjoyed the display of 16 information panels that was erected along the Broad Walk in Regent's Park over the weekend. Most people walked straight past, from what I saw, even though there were willing volunteers handing out Festival information at each end. Shame, because the panels were well-produced and fascinating, focusing not just on Nash's original plans but also future plans to make the full route pedestrian friendly. If you're interested, the boards should still be up for another fortnight, or you could always download the Nash Ramblas iPhone app if you happen to own the correct proprietary hardware. Don't ask me if the app's any good, I'm a boards person through and through. I had less luck enjoying the rest of the Festival's weekend events. The launch event finished early, so when I reached the top of Primrose Hill the Grand Old Duke of York had already marched back down again. I didn't book for the tour of Broadcasting House quickly enough, and I failed to spot the BBC history installation supposedly in one of its windows. I knew there were two design agencies open to the public in Great Portland Street but neither was labelled, so far as I could tell, so I found neither. I didn't pause for a lecture under the temporary pavilion at Park Crescent, and I wasn't thrilled by the dressed windows in Regent Street. Most worryingly, if you're the head of the LFA's marketing, I wandered inside the RIBA building on Portland Place without once realising it was hosting a variety of free events and workshops. There weren't enough signs, anywhere, so I missed loads of things because I didn't realise they were happening. Without a detailed printed programme, or a summary map to print out off the website, I had no chance of finding everything. 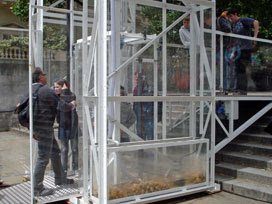 But there was one fun installation on the Duke of York Steps - a prototype water-powered lift resembling a giant hydraulic tank. "It was working this morning," apologised the LFA volunteer despatched to assist the device's creator. A small crowd waited, and waited, and was eventually rewarded with a downward journey. Brave souls assembled on the platform, which was launched by the pulling of what looked like a loo chain. Water gushed out of the upper tanks, most of it into the tanks immediately below but some of it splashing wildly over the sides. The lift speeded up somewhat in the middle of its descent, which spurred the volunteer to tug on the brake when she shouldn't have, leaving the passengers stuck awkwardly halfway down. They did reach the bottom shortly afterwards, many by now rather damp, sorry, it's not meant to do that. You'll probably not be seeing one of these gizmos providing step-free access near you in the future, but you've got to love a festival that attempts to break new ground without the aid of a safety net. Next week the focus switches to Aldgate, Stratford and all points inbetween. That's High Street 2012, of course, which is the pre-Olympic tarting-up project devoted to the road on which I live. There'll be a Temporary Stratford Museum in the shopping centre, some as-yet unannounced Routemaster bus tours, an exhibition of potential future Aldgate landmarks, and several walks and talks round about the Olympic site. I'm preparing to be surprised by what some Austrian students have got in store for Stroudley Walk, and perturbed by the Urban Gardening along the Lea by the Bow Flyover. There's lots more, if you've got the patience to click through all the events listed on the website and work out what's worth seeing where when. Let's hope they improve the listings in time for the LFA 2012. But don't you wait that long. Most days of the year, Ascot's simply a well-to-do commuter outpost in deepest leafy Berkshire. 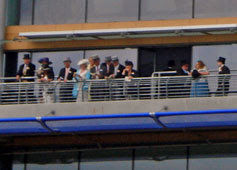 But for five days a year, when the Queen turns up to watch the horses, Royal Ascot is THE place to be seen. I went along, not to be seen but to do the watching. I took the bus. This is not the generally accepted means of transport by which the majority of spectators arrive. Most came by car, maybe the Roller if they had one, or in a big coach full of fellow spectators. Once settled in one of the expensive car parks around the perimeter of the racecourse, some got out the picnic tables and chairs for a pre-meeting hamperfest. The personalised numberplate count was high, even for a neighbourhood like Ascot, including (I noted) a Bentley Continental convertible labelled MED1A. Best not linger too long, though, because Day Five's first race kicked off at half past two. As a mere passer-by, I wasn't expecting to see very much. Car parks and front of house yes, but surely the main action would be off limits behind a security screen. Not so. Ascot's new grandstand faces the high street, with only a low shrubbery and understated black railings dividing the hoi polloi from the elite [photo]. The grandstand's out of this world, as if some ocean liner made of glass trees has docked beside the racecourse. There are two decks, on which were gathered crowds who looked like they could have been waving off the Titanic [photo]. They'd paused from their wining and dining to cast an eye down over the parade ring - usually the upcoming horses, but earlier the Queen and her Royal Procession. I couldn't see any of that, alas, I could only watch the vertically-segregated spectators watching whatever was going on in the arena bowl beneath. Not everyone comes dressed to the nines - some merely to seven or eight. Formal morning wear is de rigeur only in the Royal Enclosure, and many men had opted for a less flashy jacket and tie. The tie's important - no gentleman will get inside without neckwear, and it's a fiver extra at the ticket office if they have to sell you one. Ladies gain entrance only if the crown of their head is covered (like a synagogue, but with the genders reversed) which means improbable millinery wherever you look. Pert feathery ensembles seemed more popular than massive floppy creations, at least among the younger ladies. It was as if they were trying to see how small a hat they could get away with, maybe a few spiky flowers, possibly a miniature topper, or merely a flyaway fascinator. A steady stream of punters nipped out to Ascot High Street to stock up on important essentials. I'd never seen a branch of Starbucks with such a well-dressed crowd inside, and the folk gnawing on sarnies at Subway looked very much out of place. Two cleancut buskers regaled the escapees with a limited repertoire which seemed to consist solely of Wonderwall. Across the road a marquee in Budgens' car park was selling burgers and bubbly to an audience of zero, but no doubt hoped to do a lot better when the racegoers started streaming home. And there were police everywhere, either walking the streets or buzzing around on motorbikes, presumably because they can't be too careful when Her Maj is on the loose inside. The Ascot course is triangular, but with a long straight sticking out to one side including a bridge over the Winkfield Road. I was surprised to discover a public walkway leading almost up to the edge of the track, where one young family and myself were the only spectators at the four furlong marker. I was even more surprised to walk up just as the Golden Jubilee Stakes kicked off, and 24 horses came storming towards me. I'd not previously appreciated the enormous speed of a sprint race - one second the pounding's in the distance, the next a mass of hooves and multi-coloured jockeys is thundering by. I managed one action photograph (a bit blurry, but hopefully you won't notice in this miniature version). Even better I've captured the eventual victor, Starspangledbanner, right at the very front in the blue and orange trim. But I never saw the win, because that privilege belonged to the better-dressed in the mega-grandstand. I sloped off to the station well before the meeting ended, in the hope of getting a seat on the UpperClassExpress to Waterloo. Several racegoers joined me, despite the fact there were still three races to go - I can only assume they'd started revelling early, or else they'd got free tickets and they were bored already. For many ladies, reaching the platform meant the relief of being able to take off their high heels and drop the pretence. But back in town, they created a bubble of undeniable glamour as they tottered across Waterloo's concourse and flagged down a taxi home. Same time next year? I apologise for writing about tube maps again. Well, DLR maps in this case. Because there's a new one out. And it has daggers on it. And you know how much I hate daggers. Even when there are only three of them. Here's one of the daggers on the map. It's been added at Cutty Sark for Maritime Greenwich, which is not so much a station name as a tongue-twisting tourist commercial. This station's proved impractical to extend ready for three-carriage trains, because it's underground near the Thames and there are tunnels at both ends. Longer trains are therefore forced to employ selective door opening, and passengers at the front or rear of the train may not be able to get out. A good enough reason to stick a special symbol on the map, you'd think. So the DLR map designer has used two daggers, one here and one at Elverson Road. The third dagger is at West India Quay. A 'flyunder' opened here last year to speed up the service around Poplar, but with the side-effect of bypassing West India Quay station altogether. Some southbound services use it, and some don't, at certain prescribed times of the day. That's a good enough reason to stick a special symbol on the map, you'd think. So the DLR map designer has used a dagger. Which means there are three daggers on the map, meaning two completely different things. Two of the daggers mean "short platform", and one means "some trains don't stop here". The travelling public clearly need to understand which is which. So the designer has added some explanatory text under the map in an attempt to explain the difference. Oh dear. Talk about hard to understand, especially if your English isn't very good. † The first two sets and last two sets of doors on a three-carriage train will not open at Cutty Sark for Maritime Greenwich or Elverson Road. Please use the centre of the train. At certain times trains from Bank towards Lewisham will not stop at West India Quay station. ✽ No lift access to/from Bank station until end 2010. Sorry, did I not mention the asterisk? The designer seems to be happy to use a separate symbol for lift problems, but insists on using a dagger for everything else. What's clearly needed, if we insist on littering the map with symbols, is another symbol. Something like a star. Like this. † The first two sets and last two sets of doors on a three-carriage train will not open at Cutty Sark for Maritime Greenwich or Elverson Road stations. Please use the centre of the train. ✩ At certain times trains from Bank towards Lewisham will not stop at West India Quay station. That's better. Next, let's try to make the wording a lot clearer. The word 'stations' is redundant throughout. The map now has three dedicated symbols, so the names of the stations are also redundant. The duration of the lift problems at Bank is irrelevant. Either the map should state the times at which trains don't stop at West India Quay or it should say nothing. There's too much superfluous information throughout. Chop all that out, and I think the following is a big improvement. † Short platform. On a three-carriage train, please use the centre of the train. ✩ Some trains from Bank do not stop here. Simplified presentation will be even more important in the future because there are scheduled to be several more DLR stations with short platforms. Should the map ever end up saying "The first two sets and last two sets of doors on a three-carriage train will not open at Cutty Sark for Maritime Greenwich, Elverson Road, Pudding Mill Lane, Royal Albert and Gallions Reach. Please use the centre of the train." then we might as well sack the designer now. Another DLR map will be needed later in the summer when the Stratford International extension opens. If that new map has to have daggers too, I hope that somebody thinks a bit more carefully about how to deploy them. Good information design's not difficult, nor even expensive, but the benefits can be enormous. Two years ago I scoured the websites of the 33 London boroughs to see what walks they had to recommend. I was hunting for trails to follow, leaflets to download, pdfs to print, all specific to the borough, all for free. Some borough websites had the lot, whereas others had made little or no effort to encourage walkers to explore their leafy acres. I awarded stars according to online route provision, and knocked up a league table of walk-friendly boroughs. Two years on, several of those borough websites have upgraded. Some have merely reorganised, breaking previous links. Others have substantially restructured, adding or pruning former pages. And others have dumbed down, deleting all the interesting stuff and concentrating solely on council services. So I thought I'd better update my previous list, for those of you who fancy spending a summer day exploring your part of the city on foot. To name and shame (or praise and cheer), I've included any changes since 2008 in brackets. Here's my borough by borough London guide to free downloadable walks. Who'll spur you outdoors for a bit of healthy leisure and heritage, and whose website teams still need a bit of a kick?